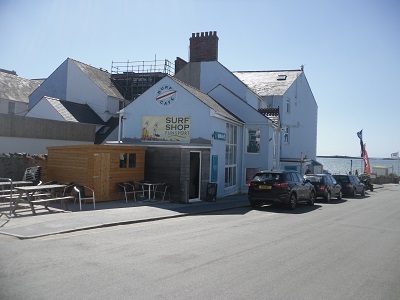 I have just come back from a wonderful afternoon walking from Rhosneigr to Cable Bay and Back and ending the sojourn with the beautiful Madame X at Mojo's Creperie. A windy day and a good idea to wear a sweater. The sky was gloriously blue and sand golden as we traipsed casually across Broad Beach, Tyn Tywyn, Porth Nobla and ended up on Barclodiad y Gawres Burial Chamber above Cable Bay. Madame X told me of her adventures here as a young lady. Phew! 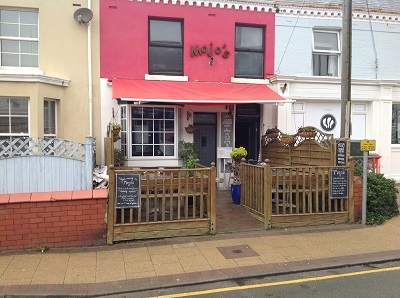 Arrived back in Rhosneigr Village in time to order and eat a meal at Mojo's . The Beautiful Madame X chose and thoroughly enjoyed a Croque Salmon and I dived into a Caesar Salad resting in a deep bowl with no apparent bottom. 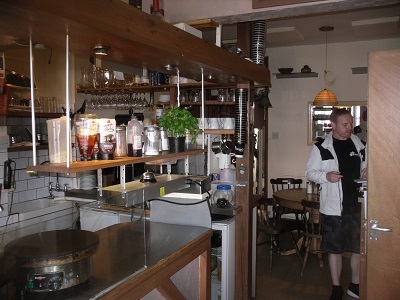 The food was good and the salad dressing exquisite. The chef and I know each other somehow, which made for a pleasant and confusing chart. All my efforts earned me a hug from Madame X, so a pretty good day after all. I really enjoy visiting Rhosneigr and add a hug to that it's the best place in the world. A hug to you all.